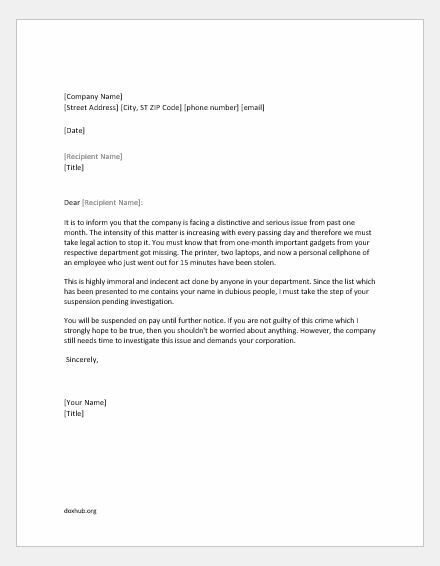 The purpose of this letter is to confirm your suspension from [DATE] to [DATE]. This shouldn’t be a new or shocking notice for you as you have been warned about it almost a month ago through a formal warning letter issued by the management. You are exempt from any official duties during this period and requested to not use any kind of authority within the specified time span. It is because not once or twice, you have been seen and warned about your improper and unaccepted attitude towards your fellow employees’ multiple times. Out of 70 employees working in the same department as your, 57 are complainant of your rude behavior. And this continued for months even after your formal meetings on this issue with Mr. John. I personally thought that you will rectify your behavior after the last warning issued to you, but you proved me wrong. I am regretfully informing you that the company has decided to suspend you from the office on pending investigation for 15 working days exclusive of Sundays, starting from 6th June to 22nd June. This is because you have been alleged of sending the confidential password of company’s database folder to one of our former employees. This could have become a very serious and crucial matter and result in drastic consequences if we didn’t cope with the situation timely. 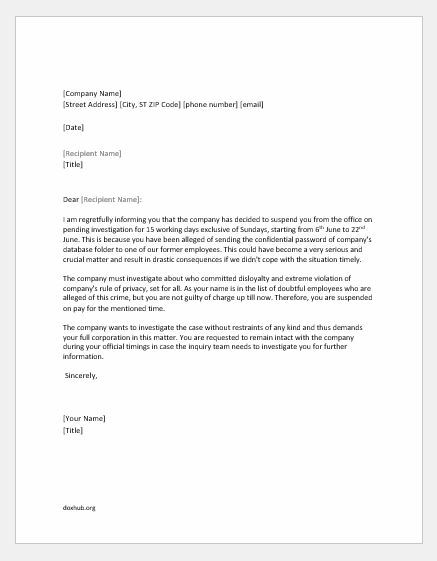 The company must investigate about who committed disloyalty and extreme violation of company’s rule of privacy, set for all. As your name is in the list of doubtful employees who are alleged of this crime, but you are not guilty of charge up till now. Therefore, you are suspended on pay for the mentioned time. 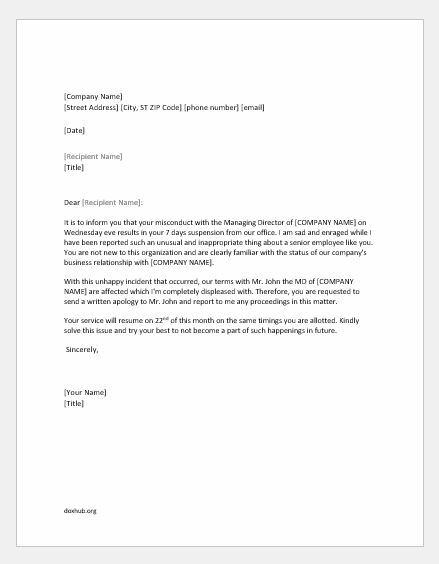 It is to inform you that your misconduct with the Managing Director of [COMPANY NAME] on Wednesday eve results in your 7 days suspension from our office. I am sad and enraged while I have been reported such an unusual and inappropriate thing about a senior employee like you. 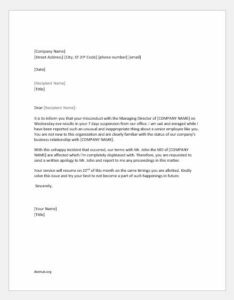 You are not new to this organization and are clearly familiar with the status of our company’s business relationship with [COMPANY NAME]. 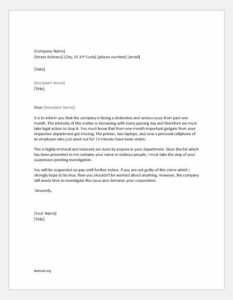 With this unhappy incident that occurred, our terms with Mr. John the MD of [COMPANY NAME] are affected which I’m completely displeased with. Therefore, you are requested to send a written apology to Mr. John and report to me any proceedings in this matter. It is to inform you that the company is facing a distinctive and serious issue from past one month. The intensity of this matter is increasing with every passing day and therefore we must take legal action to stop it. You must know that from one-month important gadgets from your respective department got missing. The printer, two laptops, and now a personal cellphone of an employee who just went out for 15 minutes have been stolen. This is highly immoral and indecent act done by anyone in your department. 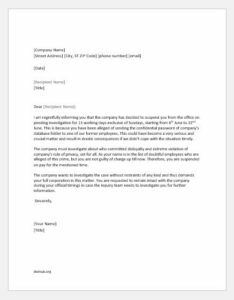 Since the list which has been presented to me contains your name in dubious people, I must take the step of your suspension pending investigation.